For some reason I had these cross my mind, found them on your website and was so excited! They are impossible for me to explain to other people, I live in Michigan and had these as a child in San Jose, California. So.....I took them to work and now there is a whole new bunch of people who love them too. This a simple candy is full of flavor and once you try it you�€™ll love it if you like peanuts flavor and sensation of something melting in your mouth! ConsHaven?t found them locally! Have to order! My friend and I love to try international foods; she stumbled across these one day and told me I needed to try them so I did. I was instantly in love with these things. I don�€™t like a lot of sweets but these are like heaven in your mouth. A MExcian friend of my brothers gave one to him and he told me about them. I went to a local Mexican store and bought a pack. They are awesome but the ones I got were very powdery. Like when you picked them up they fell apart. I dont know if they are supposed to be like that or not. Awesome anyway! I had my childhood in California and remembered mazapan from the old days. I've lived elsewhere for many years, and I don't know where to find this candy in New England. I'm sure someone has it, but I couldn't tell you where. Naturally, I was pleased to find it. 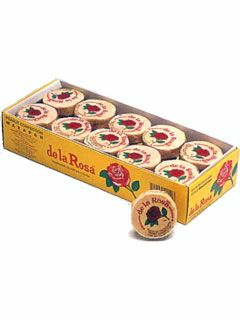 My box of De La Rosa mazapan arrived promptly and safely from MexGrocer, and it's fresh and delicious. I got a chance to introduce friends to something they hadn't seen before. Surprise: they liked it too. ProsI knew what I expected, and the candy was as expected and got here fast. ConsYou're aware this contains peanuts, right? As long as you're aware of that, there are no Cons. My 3 yr old son that is autistic loves eating this mazapan. Being a picky eater, this is one of the few thing he will eat. Plus even us patents we enjoy as well. Delicious and inexpensive. I love the rose on the wrapping. One of the many treats I got as a child and enjoy to this day. We get a case every now and then but it lasts some time. Good little peanut treat. I tryed one of these from a friend at school and i was instantly hooked. Im in kansas and not from mexican decent at all but i just had to buy more of these! Ordered a box and cant wait till it comes. We received some as a gift from a Mexican aunt. The whole family loves it! Sweet and Delicate Candy. Heaven In my Mouth!! This candy is a piece of heaven... It's deliciously irresistible and impossible to eat only one. Best treat ever! These have been my favorite candies since I was 5 years old. I am so glad I found this site because it's the only place I come to buy them now. Thank you Mexgrocer. This candy is the best!!!! I love the texture and I cant get enough of it!!!! Im so glad I found this website!!!! I absolutely love these. I bought 3 boxes and they are going fast! I share them with all my friends. They love them too! I lived in Mexico City during my early childhood and grew up eating these candies. We then moved to Texas where I was able to attain them. I now live in West Virgina where they are not available so I am really glad to have found this website. The Mazapan's came in as ordered and well packaged. They are fresh and I am glad I can expose my son to my culture. Mazapan's are a wonderful peanut confection that melts in your mouth! I am originally from Paramount California, I grew up around Hispanic culture and my friends used to eat these as well as pico and pica. I have been looking for this rose candy for over 15yrs now. I'll definitely have to order some to share with my kids. I never knew the name, only remembered the rose. I have been living in Mexico for more than a year and I finally bought one of these candies from a little boy in the street. HOOKED FOR LIFE!